A pig's diet should be balanced and provide foods that will give pigs energy, be easily digestible and offer proper nutrients and vitamins. Whether wild or domesticated, pigs need food from many different food groups to grow and develop properly. Pig farmers have many choices of foods. Corn provides energy to pigs because it is high in digestible carbohydrates and low in fiber. Other advantages of corn are the inexpensive price and the flavor; pigs love the sweetness of the corn. Both wild and domesticated pigs eat grass, leaves and flowers. While wild pigs may depend on these items as a staple, domesticated pigs use the flora and fauna as a supplement to their diets. Pig chow usually comes in the form of pellets. Pig chow has essential proteins that a pig needs to stay healthy. Pig chow should be given throughout the day in measured amounts. Pig chow should not be left available to the pigs all day, as the pigs may may overeat and become too big. A high-grain diet is beneficial to pigs as they need grains to digest other foods. Grains are also high in crude protein, amino acids and lysine. Pigs cannot survive on grains, pig chow or corn alone. For this reason many pig farmers add an antibacterial compound and/or vitamins to their pigs' diets. The compounds increase the growth rate and lower feeding costs to the pig farmer. Antibacterial compounds are best used in younger pigs, because antibacterial compounds increase the rate of growth and pigs cannot eat the compounds when they are near slaughter time. Most pigs that are raised as livestock do not eat a diet that is composed of nutritional meat sources. Pigs get their main sources of protein from pig chow. Feeding a pig pork can cause aggression and other negative behavioral traits. Other meats, such as beef and chicken can be offered in small doses to pigs. Fruits are usually given as treats to a pig, rather than as a source of nutrition. Pigs enjoy carrots, raisins, celery, berries and most any vegetable or fruit given to them. 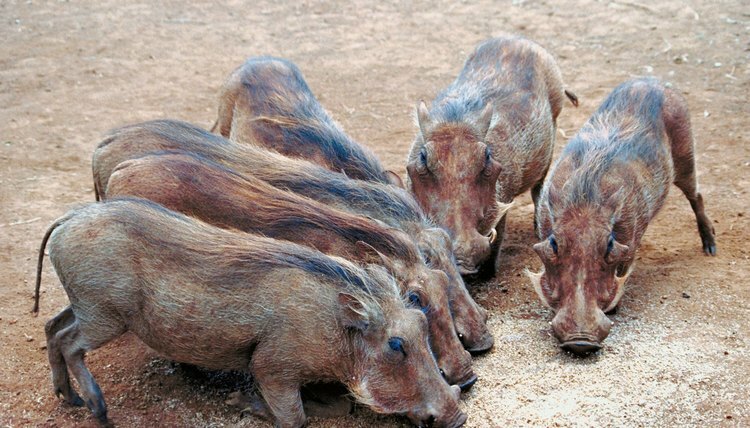 Wild pigs may not have as many opportunities to eat fruit and vegetables as domesticated pigs due to lack of wild fruit and vegetable growth. All pigs, wild or domesticated, need fresh water available to them all day. Fresh water will assist in digestion, hydration, metabolism and growth. Water consumption is based on temperature of the pig's habitat, diet, stressors and size of the pig. Younger pigs and pregnant pigs may require more water than healthy, adult pigs.